Formerly known as Sportsman's Park, Busch Stadium was also home to the baseball Cardinals. 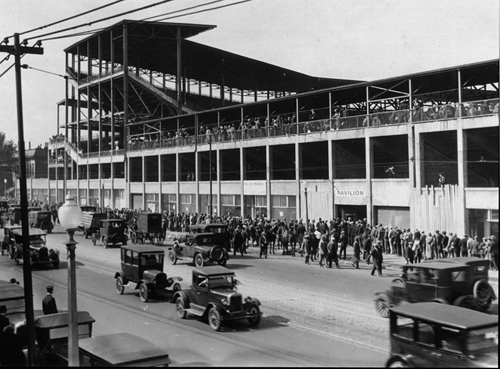 Until 1953, it had also hosted the home games of the St. Louis Browns baseball team. The Cardinals recorded their first win there in week 5 over the Dallas Cowboys. They ended the season with a 6-5-1 record, their first winning season since 1956. In 1966, the Cardinals would move to the new Busch Memorial Stadium. Professional football was changing, the NFL had agreed to add two new teams; the Dallas Cowboys in 1960, and Minnesota Vikings in 1961 while the upstart AFL was get set for its first season. However, not all was rosy the Chicago Cardinals were drowning in red ink, and were no longer able to compete with the Bears in the Windy City. Owner Violet Bidwell decided it was time for a change and began looking for a new nest for the NFL's oldest franchise. A study prior to expansion suggested St. Louis would be able to support a team nicely. With the newly formed rival league, eyeing this promising bit of territory, the NFL wanted to secure a team in the area. So, on March 13th the NFL owners unanimously voted to allow the Chicago Cardinals to relocate to St. Louis. In order to avoid confusion with the baseball team, management even considered changing the team's nickname, but in the end, the name Cardinals was retained. Sharing old Sportsmen's Park (now known as Busch Stadium) with the baseball Cardinals the NFL Cardinals would find a host of problems upon starting their first season in the Gateway City. First ticket sales fell well below the 25,000 promised by the city. Also, since there was no regular place to practice, the Cardinals worked out in an open field at a city park. After the Cardinals beat the Rams 43-21 in Los Angeles the Cardinals debuted in front of the home crowd with a 35-14 loss to the New York Giants on October 2nd. The Cards would earn their first win in St. Louis on October 23rd by beating the expansion Cowboys 12-10. The Cardinals would end up finishing the season with a winning 6-5-1 record their best mark in four years.